Now’s the time to ride off on a Street 750™ & Street Rod™ at 0%* interest or Free Insurance (Only Cash Purchase*). Also here's your opportunity to customize your dream motorcycle with Genuine Accessories worth up to INR 60,000/-. 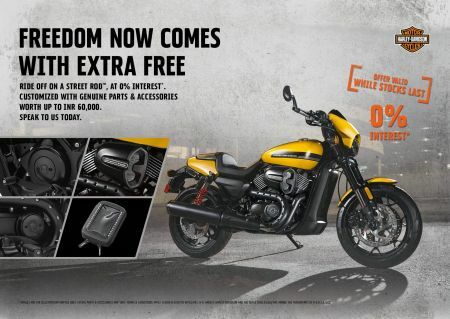 Hurry now to avail Limited period offer exclusive at Tusker Harley-Davidson. Bust out of gridlock and set your soul free.